Our season runs from May through September, Friday through Monday. We fly once a day, approximately one hour after sunrise when the winds are calmest. Meeting times vary throughout the year. Flights last about an hour. Please allow approximately 3 hours for the entire adventure. After we land our chase team picks us up and we return to our launch site for our traditional post flight picnic. Capacity is limited to 5 guests plus the pilot. Cost per person is $250 for adults and $200 per child age 6 to 12. We require a minimum of two passengers to fly. Singles are encouraged to reserve a day when others are flying and share the adventure! Private flight for two: For a truly special occasion we offer our private flight for two. 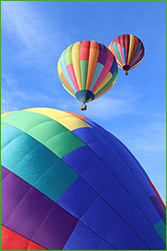 Your red carpet treatment will include an in-flight picnic, a bouquet of flowers, and chocolates presented upon landing, and of course the exclusiveness of your own balloon and pilot. The cost for two is $950. 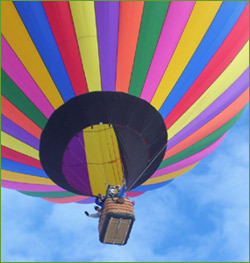 Balloon Roundup Weekend. 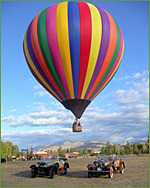 Drift over the Methow Valley with balloons from across the Northwest! Passenger rates for this festival are $275 for all passengers. Please see Reservations and Cancelations page for booking details.